Reading and writing are two of the most important skills that kids should learn early. Flashcards and writing sheets are still useful, but apps can provide an interactive learning experience to engage juniors in studying. Today, I am going to review a fun app that I think will appeal to kids who are still learning the basics of reading and writing. Monkey Word School Adventure review - A fun app for learning the fundamentals for reading and writing. One of the mini games in the app is Word Wall, a simple word search game that helps juniors learn to identify words and letters. 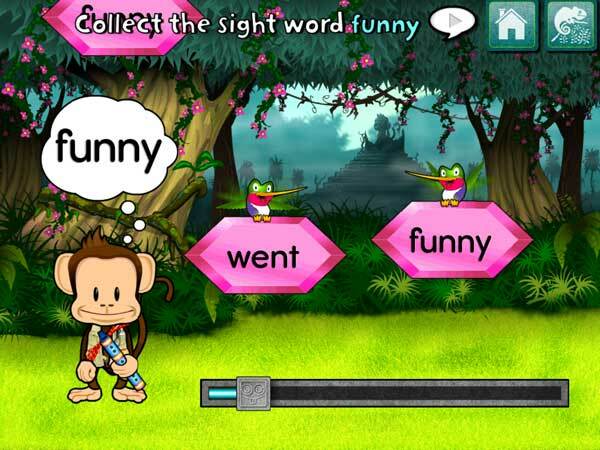 Monkey Word School Adventure is an upbeat jungle-themed app that introduces juniors to the fundamentals of reading and writing. 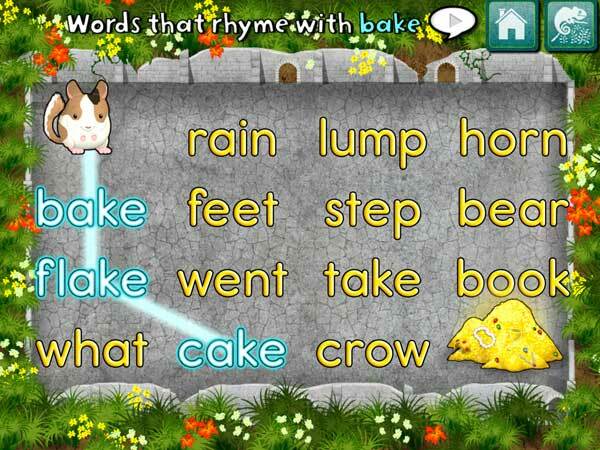 Using a variety of mini games, the app encourages juniors to learn about letters, sight words, phonics and spelling. In total, the app offers six mini games with three difficulty levels for each game. An interesting feature of the app -- dubbed as Knack Technology -- automatically adjusts the game levels based on your juniors' performance. At the beginning of the game, instructions are given out in both text and audio to help juniors complete the task at hand. There is also a subtle hint system that appears if your juniors made several wrong attempts or if they left the app idle for too long. The games in Monkey Word School Adventure are presented in an endless loop format, with the order of appearance randomized every time to avoid monotony. After completing six different games, the app rewards juniors by allowing them to pick an object -- either a frog, a butterfly, a dragonfly or a plant -- to put in their very own virtual terrarium. Monkey Word School review - Using fun games, the app entices kids to learn. This fun mini game helps juniors identify and memorize sight words. Spelling Stone. In this game, juniors attempt to spell the name of the object that is shown in Monkey's thought bubble of by dragging from a selection of letters. Depending on the level, the name of object can be between 3 to 5 letters long. In the first level, the app shows outlines in the empty spots to guide juniors as they figure out which letters go where. These outlines disappear in latter levels, but will show up if players take too long to spell the word. Letter Writing. This game focuses on teaching kids to write both uppercase and lowercase by tracing within the letter's outline on screen. At the beginning of the game, an arrow shows juniors how to write the letter. As juniors trace each stroke, the app makes it look as if they are carving on an ancient rock. This is a fun activity, but I do have to mention that the steps in some letters are written in unusual orders. Sight Birds. A unique game that helps juniors identify and memorize sight words. The game begins with Monkey who thinks of a word and then calls on a flock of gem-carrying hummingbirds. On each gem, there is a word. Before the time runs out, juniors must then tap on as many gems that have the same words as the one that Monkey is thinking. Phonics Bridge. 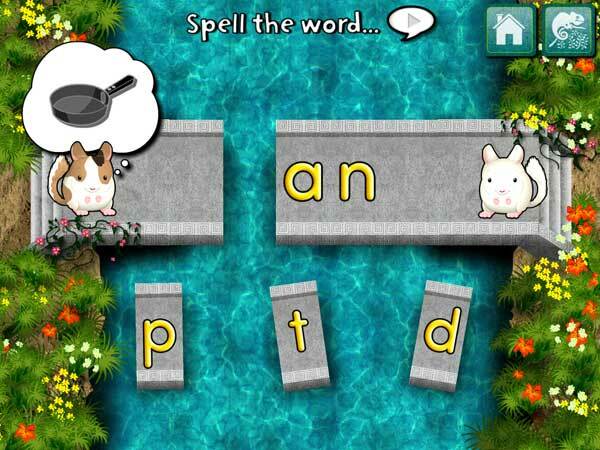 This game focuses on phonics and spelling. The objective of the game is to fix a broken bridge and reunite two chinchillas who want to meet for a playdate. An incomplete word is shown on the bridge and juniors must drag the piece that contains the missing letters from the river. They can also tap on the letters to hear them pronounced. Word Wall. A simple word search game in which juniors attempt to find 2 to 4 words in a grid that can be as small as 3x3 or as large as 5x5. In latter levels, the words can be shown horizontally or vertically. Rhyming Maze. Compared to the others, this mini game is perhaps the most challenging for juniors. Here, they are asked to create a path for an adorable chinchilla to a pile of treasure by connecting four words that rhyme. Juniors can tap on the words to have it read aloud and if they get stuck, visual cues will appear to help them get on the right track. Monkey Word School Adventure is a fun app suitable for kids aged 3-7. The mini games provided by the app are fairly simple; there are no complicated gestures needed to complete the tasks. Parents need to know that the app does not employ a punishment system. If a mistake was made, the app points out that the answer is incorrect through the use of subtle animations such as the monkey shaking his head and shows visual cues to help juniors get back on track. An interesting feature of the app is the Knack Technology which tracks and adjusts a game's difficulty level based on your juniors' performance. This feature is quite helpful in determining the right amount of difficulty for your juniors, but if you want, you can turn it off from the Settings menu. It is also worth noting that the app supports up to three player profiles that have their own settings. This is especially helpful if you have more than one child in the family who are still learning to read and write. Monkey Word School review - Helping learn about rhymes. Help the adorable chinchilla reach his treasure by connecting rhyming words. When I first tried out Monkey Word School Adventure, the first thing that came to mind was how cheerful the app was. Upon opening the app, you are greeted by a lively narrator and an upbeat background music that really invite you to play. The colorful graphics and adorable animal mascots further help create a captivating environment to keep juniors engaged in learning. I would say that the narration within the app could be a little better, but it is not much of an issue. Visuals aside, I think that the activities included in the app are excellent. It seems that the developers have taken precautions to create activities that are unique from one another and emphasize on different topics. I especially like the Sight Words mini game, which I think is quite effective to help juniors identify and memorize sight words. The auto-adjusting difficulty level is also a helpful feature that I think many parents would appreciate. One thing that I would suggest to the developers is adding a parental report feature to help track juniors' progress as they play. Combined with the ability to adjust the games' difficulty levels, this feature would make the app extremely valuable. Monkey Word School Adventure review - A beautiful and useful educational app. The app is not only fun and educational but also beautiful. Overall, Monkey Word School Adventure is a solid app. It has beautiful visuals, exciting background music and excellent mini games that make learning to read and write fun for kids. I highly recommend it.